RFeye DeepView software is the ultimate forensic tool for searching through multi-terabyte datasets for signals of interest. Designed for use with the SenS Range of RF recorders, it allows you to control and record with multiple receiver channels. You can dig deep in to the spectrum to find and analyze low-power, short-pulsed, co-channel or frequency hopping signals. DeepView can automatically index and store full-rate I/Q data in real time that is ready for rapid, in-depth post-analysis in order to search for signals of interest. This greatly minimizes post-processing and analysis time. With Deepview, you can find signals faster, saving you time and money and ensuring you never miss a signal. Dataset Overview: Displays the overview of all the IQ data currently loaded for analysis, plotting time (s) against frequency (MHz). You can select a particular area in the Dataset Overview to be displayed in the Analysis Region Overview chart for further detailed analysis. Analysis Region Overview: This displays the spectrogram of the dataset currently selected in the Dataset Overview. Plots time (ms) against frequency (MHz). As the selected area in the Dataset Overview changes, the data displayed here will also change. Analysis Region Spectrum: Displays a heatmap of the analysis region selected in the Dataset Overview, plotting power (dBm) against frequency (MHz). Time Cursor Spectrum: This displays the snapshot spectrum that is currently selected by the time cursor in the Analysis Region Overview and the Power/Time Charts. Plots power (dBm) against frequency (MHz). The data displayed in the chart reflects the spectrum at a particular time slot depending on the position of the time cursor in the other two charts. Power/Time Chart: This displays the region selected in the Dataset Overview in time-domain. It also shows a time cursor that can be dragged to a desired location using the mouse pointer. Once you have found a signal of interest, you can take measurements of the frequency and duration and export the I/Q of the signal for further analysis or demodulation. 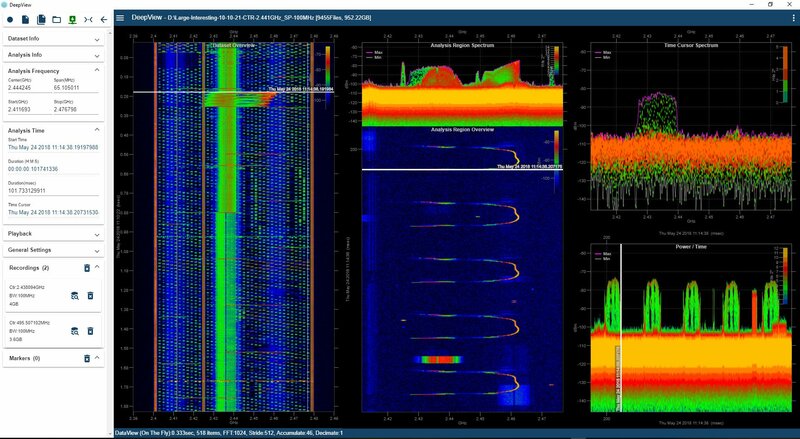 When you need to find a transmission within the congested RF Spectrum, DeepView gives you the power to quickly and easily discover, analyze and extract signals of interest. To learn more, watch the introduction to DeepView video.